A children’s club specifically for children aged from 4 to 12 years. Workshops with colouring, painting and DIY await your youngsters along with plenty of sports games. 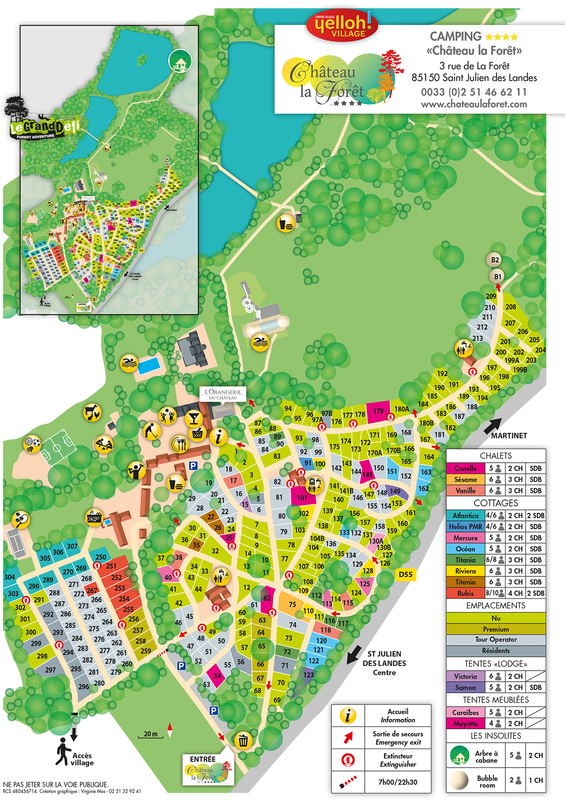 To delight all the children, whatever their age, the camping Château la Forêt is equipped with playgrounds, giant inflatable play structures and a special room designed just for the very youngest. Tree-climbing trails, accessible even to the little ones, offer your children a chance to discover new thrills and excitement in the adventure park. You can be certain they’ll be hitting the heights during their camping holiday! Paint-ball offers your darling youngsters an opportunity to give battle in full colour, thanks to the equipment specially adapted to children from the age of 6 years upwards. To get everyone into the saddle, a pony-riding centre (charge payable), invites your children to take a ride through the Château park. And horse-riding down on the beach can also be organised for those with more experience (prior booking necessary). For everyone who enjoys their sport, there’ll be a great time in store on the tennis courts and volleyball and football pitches... Plus playing table tennis and mini-golf, bouncing on the trampoline and even fishing in the lake. Six days a week and one evening a week, your kids have everything they need for an unforgettable holiday! Your children will love their holidays at the Yelloh! Village: in the park, around the castle, there is plenty for them to do!